Minister of Law and Order in South Africa from 1986 to 1991 in the final years of the apartheid era. Also Correctional Services & Deputy Minister of Defence. Adriaan Vlok was born on 11 December 1937 in Sutherland, Cape Province to Betty Oliver and Nicolaas Vlok. He grew up on a smallholding close to the Orange River, attending Neilerdrift Primary School and Keimoes High School, where he matriculated in 1956. Following three months of military training in Pretoria during 1957, he began work for the Department of Justice in the magistrate’s offices of Keimoes and Upington. Between 1959 and 1966 he served as an under-secretary at the department’s head office in Pretoria. During this time he completed his Dip Proc at the University of Pretoria in 1962. Vlok was appointed private secretary to Pelser, Minister of Justice, a post he held for four months before becoming assistant private secretary to John Voster. In this position, Vlok became more engrossed in national affairs and resolved to enter national politics. In 1970 Vlok resigned from the public service and went into business with the aim of moving into politics. Together with other private interests, he ran the messenger of the court office in Pretoria East. Vlok had an active interest in military matters and following his basic training, voluntarily joined Regiment Oranjerivier. He was promoted to the rank of lieutenant before he resigned his commission on entering active party politics. In 1972 Vlok was elected to the Verwoerdburg City Council and served on its management committee. During this time he was active in various local cultural organisation. Vlok joined the National Party in 1959 and in 1964 he began to participate actively in party functions. In the late 1960s he chaired the General Hertzog branch of the NP in Verwoerdburg and in 1970 was elected chairman of the divisional council of the Pretoria Constituency, a position he held until his election as Minister of Parliament for Verwoerdburg in 1974. On 17 September 1984, he was appointed Deputy Minister of Defence. On 14 January 1985 he was appointed Deputy Minister of law and order, a portfolio he held concurrently with that of Deputy Minister of Defence. The following year in December he was appointed Minister of Law and order. His ministry was responsible for suppression of the revolt and the detention of an estimated 30 000 people, with as many as 15 000 being held at one time during the declaration of the state of emergency. As Minister of law and Order, Vlok was also responsible for administering the controversial national security management system (NSMS). In February 1988, Vlok announced the restriction of 17 extra-parliamentary organisations, including the United Democratic Front, the National Education Crisis Committee, the Release Mandela Campaign, the Soweto Civic Association, the South African Youth Congress and the Azania Peoples Organisation. He stopped short of banning the organbisation outright, but all their activities were in effect frozen. By 1989, the number of detainees held had been substantially reduced but 300 began hunger strikes. As a result, Vlok met detainee’s lawyers and church leader, including Archbishop Tutu and many detainees were subsequently released. During the 1989 election campaign, Vlok utilised total onslaught propaganda as justification for his actions, and had to apologise in writing to the Congress of South African Trade Unions (Cosatu) for unfounded claims about its alleged violent intentions. At the end of 1989 allegations concerning police hit squads, which had possibly murdered more than a hundred political activists, surfaced in the South African press. The state president appointed an internal commission of inquiry into the allegations, but its findings were not released, and warrants of arrest were issued against only those who had already admitted to the assassination o human rights lawyer Griffiths Mxenge. The subsequently appointed Harms enquiry into political assassinations declined to call Vlok to testify on his knowledge of police hit quads. In May 1990, Vlok served on the government team, which held talks with ANC delegation at Groote Schuur, Cape Town. In the same month, following increased militancy by right wing groups, Vlok held talks with the leader of the Afrikaner Weerstandsbeweging, Eugene Terre Blanche, in effort to defuse the situation. In April 1991 the ANC requested the dismissal of Vlok and subsequently F.W. De Klerk refused. At the end of July 1991 De Klerk reshuffled cabinet portfolios and Vlok became Minister of Correctional Services In 1994 Vlok resigned from active party politics. 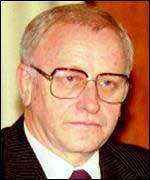 On 20 July 1998 Vlok testified before the Truth and Reconciliation Commission that De Klerk knew of the bomb planting countrywide a move aimed at destabilising the ANC and he asked for amnesty for his role in that regard. Vlok is married to Cornelia Johanna and they have two sons and a daughter.